You have chosen your date, your venue, your color theme and maybe even the dress. You have tasted cakes and met with your coordinator. The save-the-dates have been sent and the invitations chosen. All of the details are starting to fall into place. Can we take a moment to talk about something you may not have considered yet? 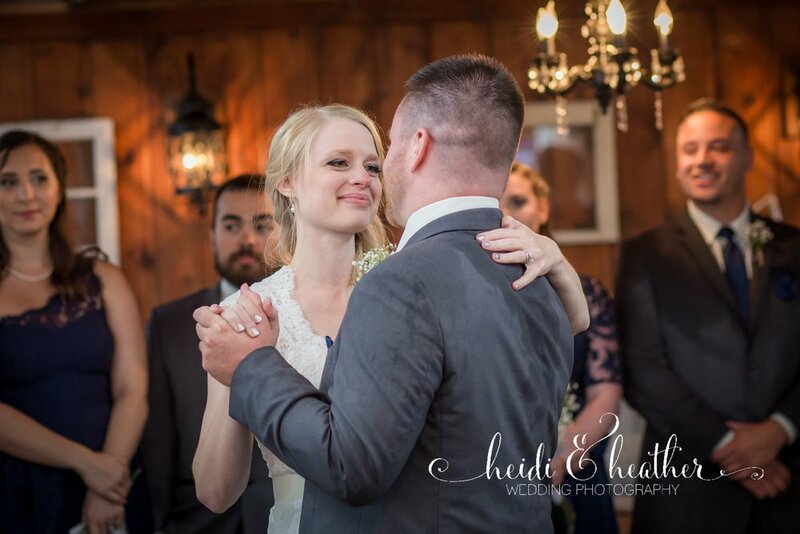 It's one of our favorite moments of the day- the first dance. Some couples prepare meticulously for this moment, spending hours of dance classes practicing carefully choreographed moves. Some couples prefer a more natural approach. Either way can be a beautiful, heartfelt beginning to the reception and a memory to cherish for a lifetime. In our experience, it's not how talented the couple is that makes the moment. It is how tuned in to each other you are that will make the sparks fly. If taking a few classes or spending an evening choosing the perfect song over a glass of wine makes you feel more prepared for that moment, then by all means, do it! Beyond that, here are a few secrets that will make this moment shine in both your photos and your memories forever. Whether it is a DJ or a band or your cousin with an iPod, designate someone to make a clear announcement so people understand this moment is for you only. Let them know when guests may join in, be it mid-song if that makes you feel more comfortable or when the next song starts. This will ensure that the dance floor is yours and yours alone. Ask your coordinator or a confident friend to monitor the situation. Make sure it is someone who can effectively and politely redirect crazy Uncle Dave from cutting in for a laugh, or chatty Aunt Betty from choosing this moment to congratulate you. Then let go and try to relax. Try not to stress out too much if things don't go perfectly. If a charming little flower girl misreads the moment and tries to join in the fun, then smile, pose for the camera, and then let your bouncer dance her back to a parent. It might seem silly to think we would have to say this to a newlywed couple! But when all eyes are on you, even the most outgoing of us can get a little stage fright. This is one of those moments though, where PDAs are strongly encouraged! Try to tune out the crowd, and focus on each other. Embrace, kiss, stare into each other's eyes, whisper in each other's ears, and don't hold back the tears! This is your moment! When that dance ends, you will be bouncing from conversation to conversation and the day will be over before you know it! So take this moment to connect and revel in the joy of your new marital status. And trust us, this will make the absolute best photos that you will cherish for a lifetime! This is your debut as newlyweds! Spin, dip, laugh and enjoy this moment! This is not the time to talk about the cable bill or chat with guests. There is plenty of time ahead for that! Put everything off for just a moment, and live in the here and now. And don't forget about Mom and Dad! Those father-daughter and mother-son dances are precious moments, too. Appreciate that sweet moment together and it will show! The bottom line is relax and enjoy these moments in time. You will be so thankful that you did, especially when you see the moment captured for a lifetime. It will be genuine, it will be beautiful, and it might just be your favorite photo together of all time!